Ivica Crnkovic is a professor of software engineering at Chalmers University, Gothenburg, and Mälardalen University, Västerås, and a guest professor at University of Osijek, Croatia. He is the director of ICT Area of Advance at Chalmers University. His research interests include component-based software engineering, software architecture, software development processes, and software engineering for large complex systems. 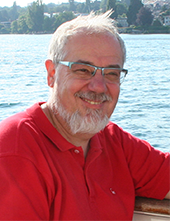 Professor Crnkovic is the author of more than 200 refereed publications on software engineering topics, and guest editor of a number of special issues in different journals and magazines, such as IEEE Software, and Elsevier JSS . Professor Crnkovic is the general chair of 40th International Conference on Sofwtare Engineering (ICSE) 2018, to be held in Gothenburg, May 27-June 3, 2018. Professor Crnkovic has been general chair of several top-level software engineering conferences (such as ICSE 2017, ECSA 2015, ASE 2014, Comparch, WICSA 2011, ESEC/FSE 2007,) and PC Chair (COMPSAC 2015, ECSA 2012, Euromicro SEAA 2006, etc.). His teaching activities cover several courses in the area of Software Engineering undergraduate and graduate courses. From 1985 to 1998, Ivica Crnkovic worked at ABB, Sweden, where he was responsible for software development environments and tools. Professor Crnkovic received an M.Sc. in electrical engneering, an M.Sc. in theoretical physics, and a Ph.D. in computer science in 1991, all from the University of Zagreb, Croatia. More information is available on http://www.ivica-crnkovic.net. Introduction to the special issue on "New frontiers in software architecture"
Det kan finnas fler projekt där Ivica Crnkovic medverkar, men du måste vara inloggad som anställd på Chalmers för att kunna se dem.